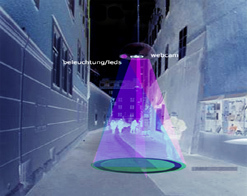 The installation „Augmented Reality System“ was exhibited in Salzburg in the old town lane Getreidegasse from 07/2005 until 09/2005. At metro-stations, in shops, at work, in front of garages, houses, in sleeping rooms – spy-cams, which are hidden in alarm-clocks, monitoring-cams in public space, panorama webcams, high-res satellite images. Every day an enormous amount of data is recorded, filtered, saved and used as input for controlling systems of different kinds. 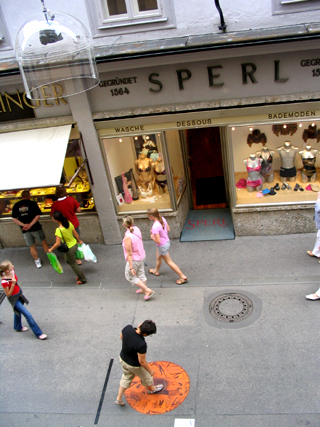 GroupGravity placed a cam in an object, which is monitoring the old town lane „Getreidegasse“ in Salzburg/Austria. The camera is recording the movements of pedestrians and translates them directly into sound. Motion capture software, developed by GroupGravity, made it possible to interact with the system in a playful way. The installation was created for the company SAMSUNG and powered by Haemmerle.